It’s all about you. It’s all about you baby. Yesterday you asked me something I thought you knew. So I told you with a smile, ‘It’s all about you‘. Say ‘if you made my life worthwhile it’s all about you’. It’s all about the company, it’s all about the cakes, it’s all about the laughter, it’s all about the fun, it’s all about the sugar-rush, from the desserts. It’s all about pistachio and strawberry. The fraisier ($6.90++) was the first one we started with. The very subtle & mild pistachio butter cream, worked for me, but it might just disappoint the pistachio purists. A simple dessert, with the almond sponge cake enveloping the butter cream. I’ll pick this again, yes I will. On my first time trying the Strawberry shortcake ($6.50++), I was disappointed by Canele’s rendition. 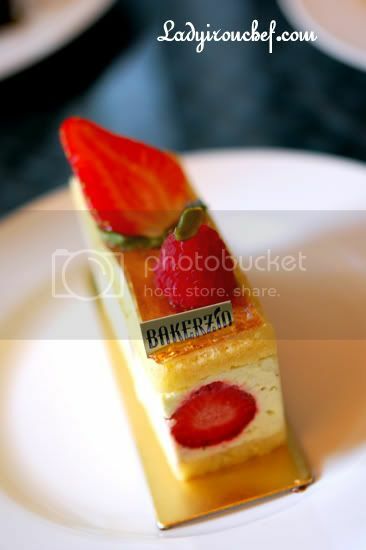 Well still basically a shortcake sponge with cream and strawberry, Bakerzin’s version appealed more to me. 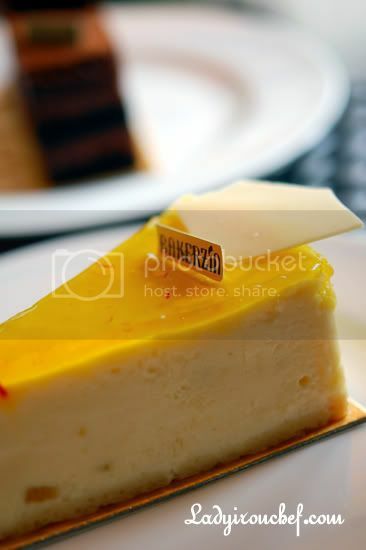 But, for people with stronger taste buds, go for other highly-flavoured cakes instead of this. It’s all about New York. 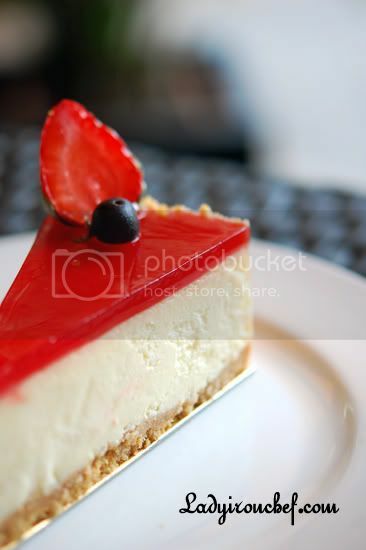 No, you do not need to go all the way to NY just for a slice of the famous New York cheesecake ($6.50++). Possibility one of the most popular cheesecake, this one here came with a coat of tangy strawberry glaze, topped with a sole berry. Light and airy, a few of us preferred this to the stronger lemon cheesecake. Lemon, cheese, and cake. I’m talking about the Bloom cheesecake ($6.50++) of course. Cheesy flavour with a strong hint of lemon. In the battle between the supporters of the heavy-cheesy, and the light subtle dessert, I’m leaning towards the light airy camp in this case. It’s not that I do not like the cheesy type, but the bloom somehow was overwhelming, although I like the lemon zest. It’s all about the love of coffee, and chocolate. 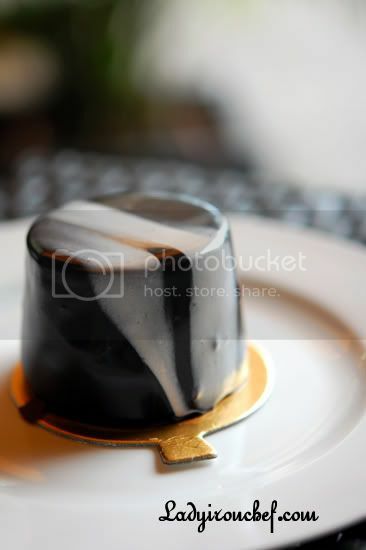 The Sumatra ($6.50++) coffee mousse with the combination of dark and white chocolate. I ain’t a coffee lover, so it didn’t quite worked out for me. It’s all about childhood, birthday, and nostalgia. I remember the time when I was a kid, eating my black forest cake to celebrate the-day-I-was-borne. The Foret Noir ($6.90++) was the biggest in slice, with chocolate flakes showered all over the chocolate almond sponge cake soaked in kirsch. You know, the only reason why I detested eating black forest cake was the presence of brandied cherries within. Why can’t we do a black forest without them inside! It’s all about chocolate. It’s all about chocolate baby. 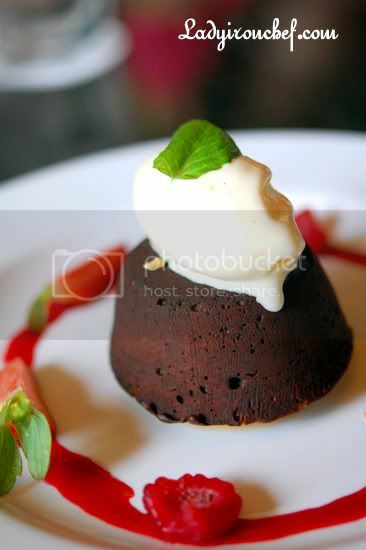 The sweet, o so sweet chocolate mousse with the flourless chocolate sponge. The “oomph” and “ahh” all came out. Heavenly chocolate. I can’t imagine somebody who will dislike this, and chocolate. The Chocolate Amer ($6.20++) was by far, one of the best cakes among the 10 that we tried. With crunchy walnuts, chocolate ganache, and caramelised bananas. Ambrosia ($6.50++). I’m always against the marriage of banana and cakes. And now, there’s even a third party, walnut involved. Not my cup, or rather slice of cake. I called this the cousin of Foret Noir. 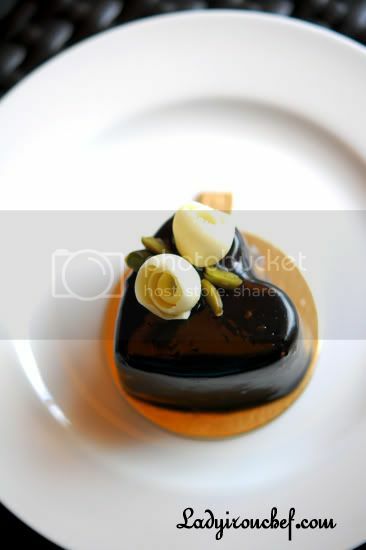 Having similar ingredients like chocolate mousse, and brandied cherries, the Coeur Noir ($6.50++) has dark chocolate glaze instead of the chocolate flakes, and a hazelnut dacquoise base. 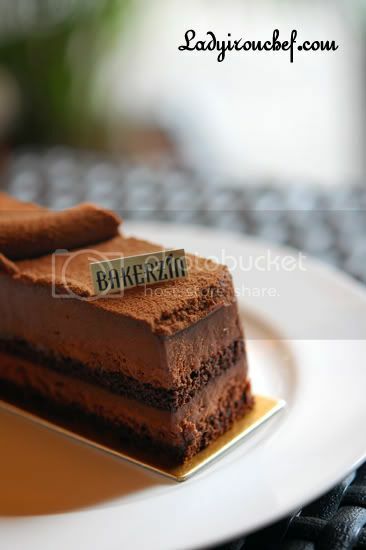 Bakerzin’s signature, warm chocolate cake ($4.90, usual price $9.80). The chocolate ooze out like lava erupting from volcano. Like I mentioned before, when you eat the warm chocolate with the cold ice cream. The chemical process between the two combined together, was magic. At the current promotional price, i’ll agree its a good deal to try this out. 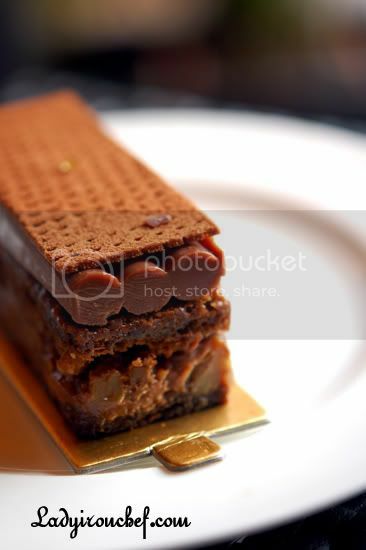 I must say the arrays of cakes Bakerzin offered, make them one of the leaders for gourmet cakes. 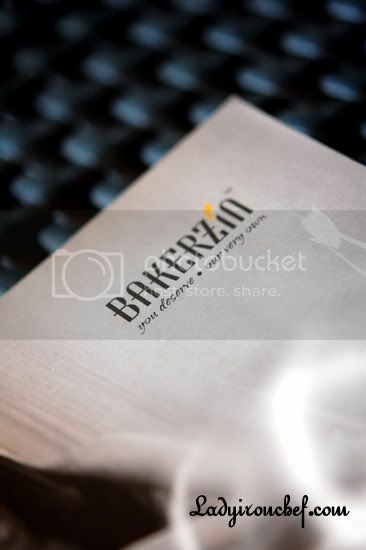 But I still think that in terms of appeals, Bakerzin loses out, with Canele having stronger marketing and branding. I’ll like to thank the warm hospitality of area manager, Miss Janet Chua, who was around at the Novena branch. Mikes last blog post..The best part about Japan…. the super-toilet! I always like Bakerzin desserts especially the Lavande. However, the main courses they offered are quite a disspointment. Anyway, appreciate your reviews on various cakes here. goodness, so many lovely (chocolate) cakes! 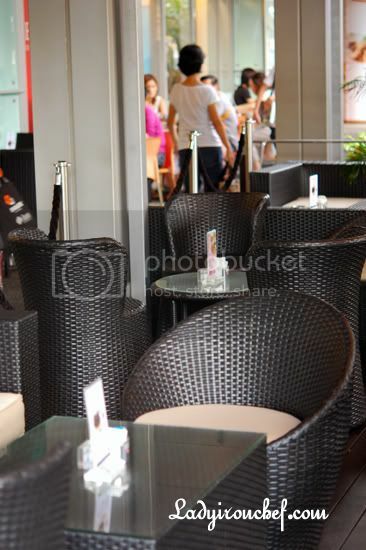 thanks for the interesting review, great pictures as well! like finally! haha. so were all the shots taken on the chair? heh. I’m a little shocked by how expensive the cakes are relative to the cost! Sorry just a patissier’s habit when we see people adding twists to traditional cakes. Anyway, lovely pictures. You sure did justice to the pretty little cakes! 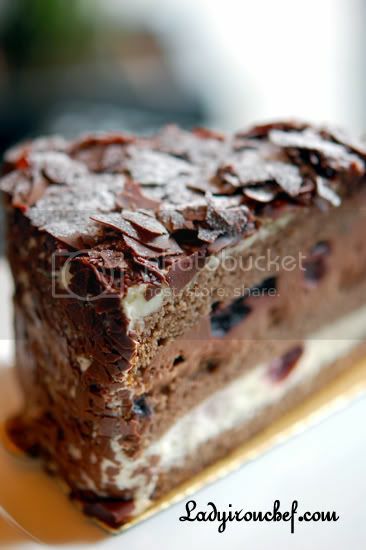 sherxr: Bakerzin’s foret noir’s sponge base is made of cocoa jaconde, a cocoa almond sponge which is a quite common base for blackforest cakes. The cherries are soaked in Kirschwasser or otherwise known as cherry brandy. Glad you like the fraisier, I am always so stressed when suggesting places to go for desserts… As for the strawberry shortcake, we share the same preference of BakerZin over Canele. yes the warm chocolate cake!! i found the promo price totally worth my money. heh heh. better than some cakes that were priced normally. i rather go for this one. but the promo is over!! I’m not a cheese, but a chocolate person! I love the Chocolate Amer, so much! =) And yes, the warm chocolate cake too. To have warm chocolate and cold ice cream in one’s mouth is totally amazing! Guess which is my bday cake! It’s one of this! Haha. I was there yesterday at the Millenia Walk branch. 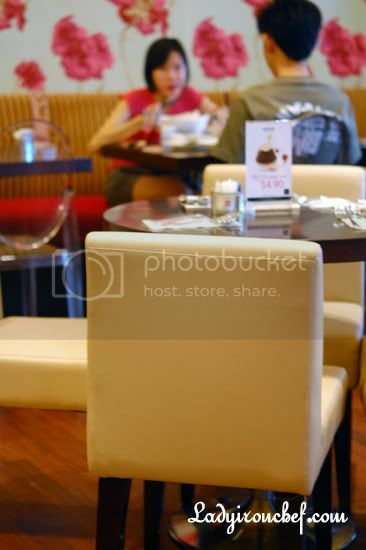 They are currently having set meals which includes a soup, free flow of breads & a main dish. Chocolate Amer was the first desert I have been tasted in Bakerzin. It is fabulous. I have also tried agolio sphagetti which is also very delicious and not too oily. I m looking forwards to purchase their macaroons that r now under $1 promotion!!!! Whenever I wan to buy macaroons, they r always out of stock!!?!! =) Will visit them again. Mike: wine garage serves good molten cake? wow 15 bucks, pricey. haha. thanks for leaving your comment dude. sherx: ahh.. its like that one, small petite pretty cakes. lol! thanks! ice: wow thanks for the information! dora: hahaha yeah the chocolate amer is good, i brought it for my brother’s birthday. haha. vicki: aye tell me! spill! 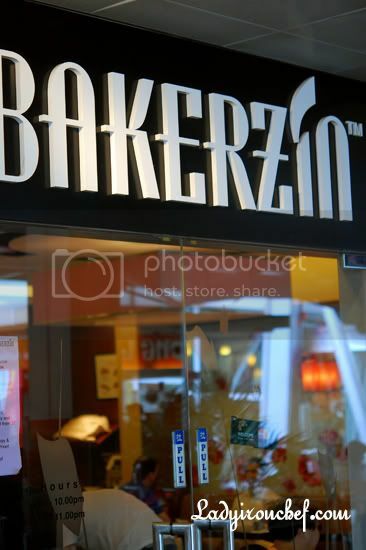 Yeah bakerzin has opened its outlets in jurong point. It is more convenient to order birthday cake. I don’t need to go orchard to seek for more WOW cakes. My mistake, the original Schwarzwalder kirschtorte is not filled with Maraschino Cherries but with Morello cherries (dark pitted cherries). I guess the Joconde addition to the recipe evolves from the french influence. The original calls for Chocolate Sponge Cake (Vanilla flavoured). Maraschino cherries are only for decoration for the top of the cake. And yes, Kirshwasser (“wasser” is similar to many european liquours “Eau de vie”, “Schnapps” or “Brandy”) is the liquour made from sour cherries (yes you can get sweet cherries which only makes a difference in Central and Eastern European region). There… the original Schwarzwalder (Schwarzwald is the Black Forest region in Germany known for their Cuckoo clocks) Kirschtorte! fen: wow how did you know one? Yeap, so r u also westie? Just visited Bakerzin again yesterday in Wisma. It was another round of fantastic experience. I m so happy that there is a promotion of a pack of 6 macaroons for just $5!!!! Which means each macaroons is just around 75cents which is cheaper than BreadTALK. We have ordered 2 sets lunch, 2 packs of macaroons, SUmatra, Ambrosia which cost us a total of $60. I feel that is worth it. I always love the idea of the marriage between banana and cake. Compared to jurong point outlets, the selected main course in e set lunch in Wisma is a total disappointment. The ham and chesse pizza is the most horrible pizza I have ever eaten. I dislike the concept of adding puff in pizza which transform pizza to a biscuit. i ate like, 3. i only discovered the promo like 5 days before it ended. HAHAHA. can you imagine! i just kept going back to eat it! 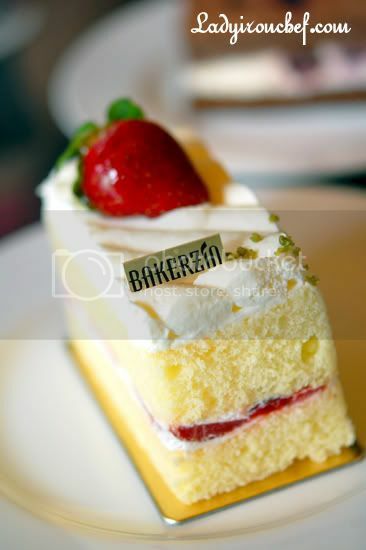 Loved the cakes from Bakerzin, it was very good. However, i’ve found a french bakery that sells deliciously nice dessert!!! It’s fondant paradiz, a chocolate fudge with chocolate ganache in it (melts in ur mouth) yummy! !it costs only $4.80, apparently cheaper as compared to the bargain from anywhere else!! It also comes with blueberry filling for blueberry lovers.. n it’s cakes and mini french pastries are vv nice too!! Love it!! I;ve been to the shop a few times without getting sick of it. The ‘Caroline’ cake is yum yum too!! It;s a choc cake with choc mousse in it topped with a special cream puff on top!! V indulging choc n unique cream in the puff!! I thk it’s a muz go places for dessert lovers..The shop has a very nice, westernised, old bakery decor too!!! no prob..it’s realli worth givin it a try ^_^ there’s free shuttle bus hourly frm yishun,khatib,sembawang station..
think yishun is every beginning of the hr, khatib is every mid hour..